It was when he started saying things like “you must be an INTJ” and “thinkers are more objective than feelers” that I became more interested in staring outside the window than listening to this guy – a psychology student. Personality types are fascinating to talk about, but depending on who’s doing the talking, it can get a bit too stiff for me. Often I’ve wondered why I’m less than enthusiastic about my personality type, or types. There are as many personality tests based on Introversion and Extroversion as there are types: Jung’s Typology, Big 5, Myers Briggs, Socionics, Enneagram. Sometimes I’m an introvert, others I’m extroverted, sometimes a feeler and others a thinker. For many, personality types provide a lucid way of understanding what were felt to be the abstract traits of ones character. Finally we can share on ourFacebook and twitter pages that we’re “INFJ’s!”, “ISTP’s! !”, “ISFJ’s!! !” We seem to believe that our entire emotional and mental functions as a human being perfectly correlate with this well thought out, 4 letter description of who we are. Introspection and self-analysis just became a whole lot easier – just 70 questions away to discover who you really are. But amidst all the introvert and extrovert extremist polarity hype there exists one forgotten type. The Ambivert. I had once remotely read of the term Ambivert while perusing through Young’s “Source Book for Social Psychology“. I’ve scoured the internet extensively and found very little on the subject. It seems this ambiguous, complicated, mythical creature is nowhere to be found. Introversion and extroversion are typically viewed as a single continuum. In other words: to be high in one, it is necessary to be low in the other. Jung and Briggs proposed that everyone has both an extroverted side and an introverted side, one having more predominance than the other. However, Isabel Briggs Myers only strictly allowed the classification of these two types, even though she based her work on Jung’s theory. Jung was of the idea that there was a third “middle” group. The Ambivert. This would allow for the possibility that the majority of the population are in fact Ambiverts. 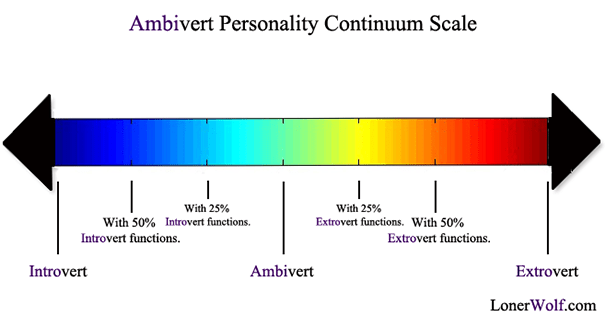 Ambiverts seem like a grey area in the personality-type world. Inconveniently, paying attention to the Ambivert would present a difficult and unnecessary complication – that is, that the entire population couldn’t be squeezed into one of two boxes. Tests can never be accurate because the psyche doesn’t work in percentages. In fact, the introvert and extrovert notion was never intended to be a testable dichotomy. The concept of the Introvert and Extrovert was originally intended to determine whether a function is introverted or extroverted – not a person. However, MBTI asserts otherwise. Isn’t is more likely that our personalities are varying mixtures of introverted and extroverted functions instead of say, all functions being introverted or extroverted? I believe that people are simply more dynamically complex than the way we polarize ourselves. The most shameless of party-goers has his insecurities, and the quietest at work can be the wildest at night. Put simply, when we’re in a comfortable environment, we’re more likely to be ourselves. The majority of us have traits of both personalities which are contextually driven. In other words, the majority of our behavior is a result of our interactions with a situation. If an “extrovert” has to present an assignment, he may become an introvert for the day by blocking out exterior stimulation and getting lost in a world of thought. Jung defined introversion as an “attitude-type characterized by orientation in life through subjective psychic contents” (or focus on one’s inner psychic activity). Extroversion on the other hand was defined as “an attitude type characterized by concentration of interest on the external object” (or the outside world). This means that just because you are considered an “introvert” does not mean you’re highly introspective and posses much self-knowledge. Most likely, it’s simply your “Extroverted” brain function that becomes over stimulated easily, causing you to avoid socializing. Meanwhile, you’re still getting lost in a world outside of your ‘self’, just like an extrovert does, by reading a fantasy book, or getting lost in a video game (an extrovert thought function). You may have a big imagination, but the function of your brain that finds ‘fun’ in story lines is the same as the extroverts who find ‘fun’ in experiences. Neither is left in solitude with the introverted function of self analysis and introspection (introvert thought function). Simply put, you can have an extroverted mind while still functioning as an introvert. However, there are those rare true unwavering personality types who posses almost all dominant extrovert functions and no introverted functions regardless of the situation. Even presenting an assignment would involve yapping away with others. Or for instance, the predominantly introverted functioners who find no sense of fun in celebrating birthdays or anything even with their closest loved ones, and would rather read a book instead. From my understanding, Jung would say that we all have “preferences” of what we would like to do, but we also have the capacity to be able to be both introverted and extroverted. And as we get older, we slowly migrate towards the center of the the continuum scale in most of our functions, as part of the self-actualization process. The majority of people, although slanted towards one side of the scale, operate using traits and preferences from both sides. Ambiverts are people who don’t really prefer one way of functioning over another. In other words, you could say they’re the neutral, middle-ground hippies. They’re equally comfortable in situations where the introvert feels most at home and situations where the extrovert is having a good time. That being said, I would consider myself an Ambivert. I don’t feel drained from social interaction or going out shopping, and discussion energizes and invigorate me. I constantly seek dare devil risk taking stimulation, while simultaneously relishing quiet time with mybooks and catching up on scientific essays. I’m both overly confident, but also reclusive and critical in thought. The freedom with Ambiversion comes in finding both Introverted and Extroverted worlds satisfying and rewarding. Ambiversion helps you to enjoy a varied life. 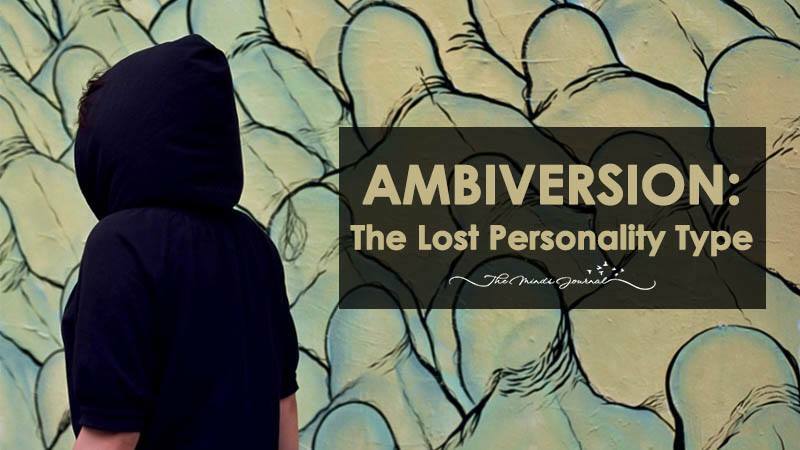 Ambiverts have enough introversion to slowly absorb the world around them and enough extroversion to be able to propound ideas and express themselves (through writing of verbally) without feeling depleted. Mateo Sol is a prominent psychospiritual teacher whose work has influenced the lives of thousands of people worldwide. Born into a family with a history of drug addiction, schizophrenia, and mental illness, Mateo Sol was taught about the plight of the human condition from a young age. As a spiritual guide and teacher, Sol&rsquo;s mission is to help others experience freedom, wholeness, and peace in any stage of life. See more of his work at&nbsp;&amp;lt;a href=&amp;quot;https://lonerwolf.com/&amp;quot;&amp;gt;lonerwolf.com&amp;lt;/a&amp;gt;. My God!When will people learn to stop profiling personalities.